RugbyRecruit: Congrats on starting your freshman year at LU-Belleville! Was RugbyRecruit useful in helping you find a good fit for you? Maek: Yes, RugbyRecruit played a big part. Coach Joe found my profile and sent me an email about recruitment. Thank you! 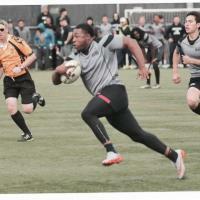 RugbyRecruit: How has your time at LU-Belleville been so far? Maek: I'm having a great time at LU-B. It's a great program and very competitive. RugbyRecruit: That's why your're there, right? The only way to get better is by playing against better competition. Where would you say you are on the depth chart right now? Maek: Right now I'm playing JV, but I'm competitive for playing time on the varsity. The depth chart for loose forwards pretty deep. RugbyRecruit: Was it difficult for you to get a student visa, or did the school help you out? Maek: Getting the visa was pretty easy. Once the school gave me the I20 all I had to do was hand it over to the embassy during the interview and my visa was approved. RugbyRecruit: Good luck on the rest of your season and college career Maek! Looking forward to watching your development.